Maize germ meal (corn germ meal) is the by-product of oil extraction from maize germs obtained from maize processing. It is a product of moderate to good nutritive value suitable for all classes of livestock but its composition is highly variable. Maize germ meal is considered a good ingredient for all livestock species (Ewing, 1997). Maize germ meal readily absorbs liquids such as molasses and tallow and is, therefore, a useful carrier for liquid nutrients (CRA, 2006; BeMiller et al., 2009). It is a very variable product: its protein, oil, fibre and starch contents depend on the processes used for producing the germs and for extracting the oil, together with the amount of other maize by-products mixed with the spent germs. The residual oil, for instance, may be lower than 5% DM or higher than 14% DM, which will affect the energy value of the product. Likewise, the amount of residual bran will affect the fibre content and thus the suitability of the germ meal for pigs and poultry (Ewing, 1997). As a result, the nutritive value of a given batch may differ from values published in feed composition tables by a large margin; if possible, maize germ meal should be analysed on a case-by-case basis, or at least by origin (processing plant). 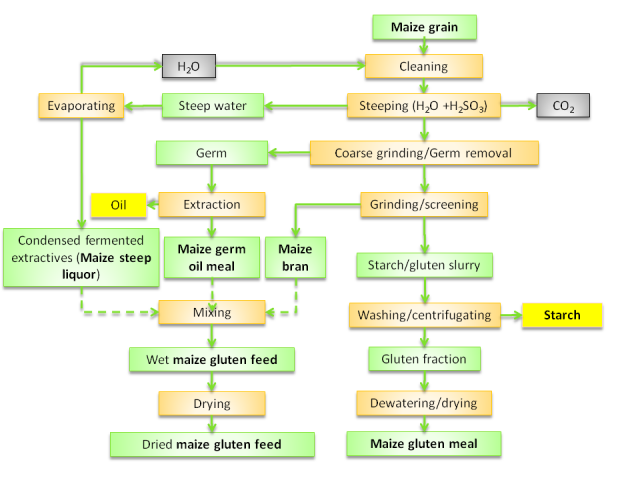 It is important to note that while there are official definitions for maize germ meal and maize germs, these products are actually part of a continuum of loosely named by-products yielded by the wet milling and dry milling maize industries (see Processes below). Products sold under these names may contain variable, or even substantial, amounts of bran, endosperm fragments and other residues. Maize germ meal from the wet milling industry can be very close to corn gluten feed, and from the dry milling industry very close to maize bran or hominy feed. Likewise, it is difficult to tell poorly extracted maize germs from low-oil maize germs from dry milling. The names themselves can also be a source of confusion: in French, "tourteau de germes de maïs" (maize germ meal) sounds like "tourteau de maïs" (hominy feed); in English, "maize germ meal" can easily be mistaken for "maize germs" and studies of "maize germ meal" (a product containing 1 to 20% oil) may actually concern full-fat maize germs (50% oil). Unlike most ingredients, maize germ meal is not a single product but a group of products of widely differing nutritional value. Maize germ meal and maize germs are feed commodities traded worldwide. Maize germ, which contributes about 11% of the kernel weight, contains 45-50% oil and about 85% of the oil kernel (CRA, 2009). The germ is a distinct entity that can be easily separated and then extracted to produce maize oil, yielding maize germ oil meal as the main by-product (Crawshaw, 2004). The germs themselves are obtained from maize processing from wet milling (starch production) or dry milling (maize grits, maize flour, maize meal and ethanol production) (Ewing, 1997; Stock et al., 1999). Germs are removed in the wet milling process to facilitate starch extraction, whereas they are removed in the dry milling process to improve the stability of maize grain products for use as food (Moreau et al., 2005). In the wet milling process, maize grain is steeped in water and then separated into kernels, from which starch is later extracted, and germs. The germs are washed, dried, and extracted first by mechanical extraction and then by solvent (hexane). Maize germ meal consists of the spent germs and other maize grain fragments (CRA, 2006; BeMiller et al., 2009). In the dry milling process, abrading action strips away the germ and pericarp while leaving the endosperm intact. While the endosperm continues through the milling process, the combined bran and germ are aspirated to remove the bran, allowing the germ to be extracted, yielding oil and maize germ meal (Stock et al., 1999). Maize germ meal is usually mixed with other by-products to create a final feed ingredient. In the wet milling process, spent germs are mixed with maize bran and maize steep liquor to make corn gluten feed (CRA, 2006). In the dry milling process, the spent germs are mixed with broken kernels and inseparable fractions of germ, pericarp and endosperm to produce hominy feed (Stock et al., 1999). However, maize germ meal is also sold as a separate product. While maize germs are usually extracted, non-extracted (full-fat, high-fat) maize germs are sometimes available, either from the wet milling or the dry milling process. Because germs from dry milling have not been subjected to steeping, they should retain more soluble protein, phosphorus and starch than germs obtained from wet milling. However, they contain much less residual oil (Kalscheur et al., 2012; Moreau et al., 2005). The production of beer from maize (chicha) in South America also yields maize germs (Bocanegra et al., 2012). Maize germ meal obtained from the wet milling process for starch production has a relatively high protein content (22-31% DM). The crude fibre content is moderate (10% DM) but the NDF content is high and variable (30-60% DM). Residual oil ranges from less than 3% to more than 10%, reflecting differences in oil extraction efficiency. Oil-rich maize germ meal from wet milling is slightly poorer in protein than well defatted maize germ meal (25-32% vs. 22-30% DM). Like other maize by-products, maize germ meal tends to be poor in lysine (about 4% of the protein), though richer than maize grain (3%). Maize germ meal from wet milling is relatively close to corn gluten feed but contains more protein, more oil, less fibre and about the same amount of starch and is, therefore, of higher nutritional value. Maize germ meal is particularly rich in phosphorus, since the germ contains much of the P in the grain (Widmer et al., 2007). Maize germ meal obtained from dry milling has a lower protein content (10-20% DM), less fibre and more starch than maize germ meal obtained from wet milling. Residual oil depends on the extraction method and can also vary between less than 1% up to more than 20% DM. Maize germ obtained from wet milling usually contains 11-16% of protein in the DM and 40-50% oil (Miller et al., 2009). Maize germ from dry milling contains a little more protein (13-18% DM) and much less oil (20-30% DM) (Moreau et al., 2005). The residual oil contains 16% palmitic acid (16:0), 28% oleic acid (18:1) and 56% linoleic acid (18:2) (Miller et al., 2009). The oil in oil-rich maize germ meal and maize germs can oxidise and become rancid when the products are stored for long periods or under less than appropriate conditions (McDonald et al., 2002; Ewing, 1997). Maize germ and maize germ meal are particularly rich in phytic acid. Maize germ was found to contain 6.4% (as fed) of phytic acid, more than wheat bran (4.8%) and sesame seed (5.3%) (Graf et al., 1990; Harbach et al., 2007). Depending on their composition, maize germ meal and maize germs are used in ruminant feeding either as a source of energy (as substitute for cereal grain, notably maize), protein or fat. Maize germ meal is highly palatable to ruminants. The maximum inclusion rate recommended for dairy and beef cattle is 25% of the diet. Lower rates are recommended for calves (20%), lambs (15%) and ewes (20%) (Ewing, 1997). Maize germ meal is very digestible to ruminants (OM digestibility 80-85%, Sauvant et al., 2004). Effective DM and protein degradability of maize germ meal (protein 10%, fat 8% DM) were found to be relatively high (75 and 74%, respectively) (Marcondes et al., 2009). In the USA, dairy rations were successfully formulated with 15% maize germ meal (protein 17%, fat 18% DM) from dry milling ethanol production, substituting forage and concentrate feeds. Dry matter intake, yields of milk and milk components were maintained, with no major differences in rumen fermentation or digestibility (Kelzer et al., 2009). In Venezuela, supplementation of dual purpose cows fed maize stubble, pasture and fruit with maize germ meal (protein 22%, fat 11% as fed) increased milk yield, duration of lactation and reproductive performance (Miranda et al., 2002). In the USA, a series of experiments evaluated solvent-extracted germ meal in the diets of steer calves, finishing yearling steers and finishing lambs, as an individual feed ingredient, or when combined with steep liquor containing distillers solubles, or with maize bran and steep liquor containing distillers solubles to simulate wet maize gluten feed. Maize by-products replaced dry-rolled maize. In lambs, solvent-extracted germ meal lowered DM intake, digestibility and feed efficiency relative to maize. In finishing yearling steers, solvent-extracted germ meal promoted higher gains than the maize-based control diet when comprising less than 50% of the dietary DM. In calves, enhanced feed efficiency was observed when solvent-extracted germ meal was blended with steep liquor containing distillers solubles. As a component of wet maize gluten feed, solvent-extracted germ meal promoted greater gain:feed ratio than maize bran. In calf diets based on 55% concentrates, replacing 50% of maize bran with solvent-extracted germ meal (7% in the diet) improved feed efficiency without diminishing performance and DM intake. The potential for acidosis in finishing cattle was diminished when maize by-products partially replaced maize grain. However, a combination of maize bran and steep liquor with distillers solubles offered greater protection from acidosis than when solvent-extracted germ meal was added to this blend, due to a lower dietary energy content (Herold et al., 1998a; Herold et al., 1998b; Herold, 1999; Herold et al., 1999; Herold et al., 2000). Maize germ meal from various industries has also been tested in Brazil, China and Ethiopia, often as a substitute for maize grain. It can usually replace part of the maize in the diet, except in a lamb trial where maize germ meal was detrimental to performance (Silva et al., 2013b). It should be noted that extrapolating the results of those trials (where the nature and composition of maize germ meal is not always stated) to all types of maize germ meal is not recommended. Maize germ with a high oil content should be used in limited amounts since it contains mostly unsaturated fat, which can be detrimental to rumen function and can reduce fibre digestion if fed for long periods (Ewing, 1997). Maize germ from dry-milling ethanol production had the fastest rate of fermentation compared to bran or dried distillers grain with solubles (DDGS) (Tedeschi et al., 2009). It also had higher DM degradation rates than DDGS and soybean meal. Rumen protein degradability was 72% in maize germ from dry milling compared with 44-48% for DDGS (Abdelqader et al., 2009b). Maize germ from wet milling ethanol production was found a viable energy source for mid-lactation dairy cows. Maize germ (protein 13%, fat 44% DM) included at 3.6% in the diet of Holstein cows supported milk production and protein yield equal to whole cottonseeds and tallow, but milk fat percentage and fat yield were less from maize germs than cottonseeds. Milk fatty acid composition from cows fed maize germs contained more of cis-9, trans-11 conjugated linoleic acid (Miller et al., 2009). Maize germ from dry milling ethanol production was found to be a suitable alternative source of fat for energy in lactating dairy cows. Fat from maize germ may be relatively protected. Feeding dairy cows with maize germ (protein 16%, oil 20% DM) at 7 and 14% of diet DM increased milk yield and energy-corrected milk, as well as fat percentage and yield compared to cows fed a control diet. Milk protein yield tended to decrease as the concentration of maize germ increased in the diet. Concentrations of monounsaturated and polyunsaturated fatty acids in milk fat increased with maize germ inclusion, at the expense of saturated fatty acids. Intake was highest at the 14% inclusion rate (Abdelqader et al., 2009a). In the USA, maize germ (protein 12%, fat 45% as fed) was found to be a suitable source of supplemental fat in cattle finishing diets. Growth and carcass characteristics of crossbred steers and heifers offered finishing diets containing 10% dried maize germ were similar to those obtained with 4% tallow. Addition of maize germ might decrease the incidence of liver abscesses (Montgomery et al., 2005). Recommended inclusion rates are 15% of the diet for growing pigs, weaners and sows, and 10% for finishing pigs (Ewing, 1997). In Brazil, inclusion of 15% defatted maize germ meal in the diet (protein 11%, fat 1.5% DM) was found the most economically profitable for growing or finishing pigs (assuming that the price of maize germ meal is 80% that of maize grain) (Moreira et al., 2002). Higher inclusion rates have been reported in the literature. In Brazil, defatted germ meal (protein 11%, fat 1% DM) was included at up to 30% in diets for growing and finishing pigs without affecting daily weight gain and carcass characteristics (Soares et al., 2004). In Venezuela, a mixture of bran and maize germ meal was included at 40% (partially replacing maize) without adverse effects on body weight gain (López et al., 2003). In Brazil, finishing pigs were fed diets including 20% defatted maize germ meal supplemented with an enzyme complex, resulting in improved performance without compromising carcass characteristic and meat quality (Silva et al., 2013b). The important concentration of phytic acid in maize germ meal, included at up to 40% of the diet, was shown to prevent meat lipid oxidation while maintaining normal animal growth performance (Harbach et al., 2007). Defatted maize germ meal included at 40% of the diet (partially replacing maize) with or without phytase supplementation had no effect on performance but improved meat and sausage quality. Phytase supplementation decreased P and Ca excretion (Pacheco et al., 2012a; Pacheco et al., 2012b). The ME value of low-oil maize germ (protein 18%, fat 18% DM) was 15.5 MJ/kg DM, which is lower than that of maize grain despite a much higher energy content (Anderson et al., 2012). Another study reported an even lower ME value of 14.0 MJ/kg DM for a high-oil maize germ (protein 18%, oil 33% DM) (Liu et al., 2014). Maize germ has a lower energy and amino digestibility than maize (Widmer et al., 2007; Liu et al., 2014). This can be explained by the higher fibre content and possible lower digestibility of fibre in maize germ (Widmer et al., 2007). In the USA, addition of up to 30% maize germ (protein 16%, fat 17% as fed) in diets containing 30% DDGS did not negatively affect pig growth performance, carcass composition or muscle quality, but belly firmness was reduced (Lee et al., 2012). Maize germ (protein 14%, fat 14% as fed) added as a source of fat at 15% in the diets of finishing pigs fed 30% DDGS failed to improve carcass fat quality (Lee et al., 2013). In nursery pigs, high-oil maize germs (protein 15%, fat 47% DM) included up to 12% in the diet resulted in a similar performance to that obtained with the control diet, but failed to improve feed efficiency when compared to diets including the same amount of added fat from maize oil (Hastad et al., 2002). In a comparison of maize by-products produced in the USA, the AME value of defatted maize germ meal (protein 24%, fat 2% DM) was 8.3 MJ/kg DM, a value lower than those of DDGS (9.0-12.6 MJ/kg DM), maize bran (12.6 MJ/kg DM), maize germ (13.0-14.6 MJ/kg DM) but higher than that of corn gluten feed (7.3 MJ/kg DM) (Rochell et al., 2011). In Brazil, the AME value for defatted germ meal (protein 11%, fat 1% DM) was 11.2 MJ/kg DM (Brunelli et al., 2006), whereas the AME value for maize germ meal (protein 11%, fat 9% as fed) was about 15.9 MJ/kg DM (Brito et al., 2005c). The recommended dietary inclusion rate for maize germ meal is 20% (Ewing, 1997). Several trials in Brazil have studied the suitability of maize germ meal for broilers. The optimum dietary inclusion rate of maize germ meal (protein 11%, fat 9% as fed) was 21-22% until the birds were 38 days of age and it then replaced all of the maize in the final phase (Brito et al., 2005a). Similar optimal inclusion rates were observed when maize germ meal replaced sorghum (Stringhini et al., 2009). Defatted maize germ meal (protein 11%, fat 1% DM) was satisfactory up to 20% of the diet with no effect on performance and carcass traits (Brunelli et al., 2006). Adding phytase to broiler diets including 20% defatted maize germ meal had no effect on growth performance and carcass yield, but increased oxidative stress (Brunelli et al., 2012b). In Brazil, defatted maize germ meal (protein 11%, fat 1% DM) was included at up to 30% in commercial layer diets without any detrimental effects on egg production. However, phytase addition was necessary to improve the yolk colour (Brunelli et al., 2012a). The inclusion of 50% maize germ meal (protein 12%, fat 10% DM) in layer diets (30 to 60 weeks) did not affect laying performance and quality of both eggs and shells (Brito et al., 2005b). For hens that have moulted, in the second egg production cycle the recommended inclusion rate was 16%, replacing 25% maize (Brito et al., 2009). The AME value for maize germ (protein 16-18%, fat 16-18% DM) was 13.0-14.6 MJ/kg DM, higher than that of most maize by-products (Rochell et al., 2011). Maize germ from dry milling ethanol production (oil 20% DM) was found to have a much higher TME (18.1 MJ/kg DM) than regular and high-protein DDGS (14.9 and 12.4 MJ/kg DM, respectively). Amino acid digestibilities of maize germ were also higher, possibly due to less heat damage, but relative phosphorus bioavailability was much lower (Kim et al., 2008). The ileal energy digestibility of maize germ (protein 11%, fat 56% as fed) increased from 75 to 81% between 20 and 40 days of age (Lima et al., 2012). In India, the inclusion of maize germ (45% oil) at 5 to 15% did not have any adverse effect on the carcass characteristics of broilers. The percentage of linoleic acid and total polyunsaturated fatty acids increased linearly with increasing levels of maize germ (Sahib et al., 2014). Maize germ meal is a protein and energy ingredient used at least since the 1940s in rabbit feeding (Reifenstein et al., 1941; Sokoloff et al., 1951), and commonly used today in experimental and commercial diets (Garcia et al., 2000; Nizza et al., 2000; Lebas et al., 2012; Wang et al., 2010). The inclusion level varies, usually between 5 and 10% (Nicodemus et al., 2002; Wang et al., 2010). In an Italian study, maize germ meal was introduced at 20% in the diet without affecting growth and slaughter rate, while slightly improving feed efficiency compared to a control diet based on wheat products (Nizza et al., 2000). An Egyptian study proposed an ME value of 11.5 MJ/kg DM, close to that of cereals. The calculated protein digestibility is about 75% (Lebas, 2013). The protein of maize germ meal is deficient in lysine (75% of requirements) and provides only 4-5% of sulphur-containing amino acids and threonine above the requirements of growing rabbits. In the USA, defatted maize germ meal (protein 10-12%, fat 1%) included at up to 35% in the diets of channel catfish fingerlings did not affect diet consumption, net yield, weight gain, FCR, survival, fillet yield, and fillet protein, fat and moisture concentrations. However, carcass yield decreased as dietary maize germ meal levels increased. Depending on prices, defatted maize germ meal can be used interchangeably with corn gluten feed in channel catfish diets as replacements for maize grain, wheat middlings, and soybean meal to reduce feed cost (Li et al., 2013b). Apparent digestibilities of defatted maize germ meal (protein 24%, fat 3% DM) for channel catfish were lower than those of soybean meal (84 vs. 94% for protein and 57 vs. 79% for energy) (Li et al., 2013a). The apparent digestibility of defatted maize germ meal (protein 18%, fat 3% DM) in Nile tilapia was similar to that of soybean meal for protein (99 vs. 97%) and slightly lower for energy (72 vs. 77%) (Dong XiaoHui et al., 2010). BeMiller, J. N.; Whistler, R. L., 2009. Starch: Chemistry and Technology. 3rd. ed. Academic Press, 894 p.
García, J., N., N. ; Espinosa, A. ; Pérez-Alba, L. ; de Blas, J. C., Carabaño, R., 2000. Effect of inclusion of grape-seed meal on disaccharidase activity in the small intestine of growing rabbits. 7th World Rabbit Congress - Valencia (Spain), 4-7 July 2000, Vol. C, 209-215. McDonald, P.; Edwards, R. A.; Greenhalgh, J. F. D., 2002. Animal Nutrition. 6th Edition. Longman, London and New York. 543 p.